Join best-selling author and Functional Life Coach™ Mastin Kipp as he guides you on a 40-day journey, inspired by Joseph Campbell’s model of the hero’s journey, to identify and dissolve whatever’s holding you back, break free from trauma and victimhood, and transform your life. Not only will you change your life for the better, but in doing so, you’ll improve the lives of the people you love. With Claim Your Power, you’ll wake up energized by the momentum you’ve unleashed, an energy that will only increase with each new accomplishment and breakthrough. And you’ll discover the peace and sense of self-respect that comes only to those who follow through and bring their Purpose to life. Are you ready? We’ve got no time to waste. Your life’s unique Purpose is calling, and so are all those whose lives you’re meant to touch. Remember to get out there, take action, and make it real! "Mastin has given readers a high-energy healing guide--rich in inspiration, instruction, and superb information. Well done." "In an age of shallowness and distraction, Mastin offers an effective and powerful solution: a deep life dedicated to the thing that matters most--your purpose." "Trauma and addiction rob us of our ability to be free and to serve the higher calling, which is our life's purpose. With Claim Your Power, Mastin has truly laid the groundwork for a person to walk from the darkness of addiction into the light of freedom. If you read this book, buckle up. Your positive evolution is coming!" "So often we look to diets, supplements, pills, external diversions, and even addictions to relieve our symptoms and suffering. But the pain we feel is that of the body holding past trauma, which none of those will heal. In this book, Mastin Kipp brings us to a possibility of healing--the inspiration we crave and the steps we need to wake up from the trance that is keeping us stuck in the belief that that we are our wounds. If you're tired of living a less-than-satisfying life and are ready to live courageously, this is your next step." "Mastin Kipp doesn't just suggest the possibility that we could live a better life; his very presence seems to demand that we do so! Claim Your Power invites us to meet an infinitely creative universe with an infinite willingness to receive its gifts." 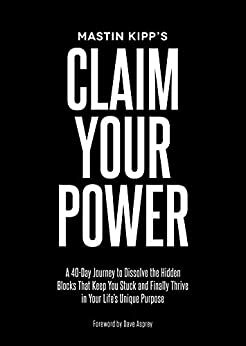 "For a long time I've been a big believer in Mastin Kipp, and if you read Claim Your Power, you will be too." "Mastin wrote a timeless legacy harmonizing safety, inspiration, and direction, allowing me to slice through fear and ego. I was able to explore, understand, and release my multiple traumas of sexual abuse, physical abuse, and PTSD in order to claim my power. Forever grateful!" "With Claim Your Power, Mastin Kipp has done for personal growth and healing what The Virgin Diet did for nutrition--created an innovative, researched, and time-tested system that creates lasting results, fast." "I first met Mastin Kipp at 5 a.m. in the gym. He was tirelessly pounding away on the treadmill while writing a book and working on e-mails. I knew right away that this guy not only had an amazing work ethic, but was also extremely passionate about something. Later, I discovered his deep and unique wealth of knowledge on little-known tactics for removing the hidden obstacles that keep us stuck in life, and finding our life's true purpose. I find this guy completely fascinating, and I think you will too. Enjoy his work. It will change your life." "Liberation of spirit is the greatest gift anyone could give another. Mastin Kipp has developed a process to rid the root cause of human suffering that holds us back from living the best version of ourselves. It's brilliant." 5.0 out of 5 starsLIFE CHANGING. DOABLE. AMAZING. Transformation step by step. I'm on day 37 of 40 and I cannot speak highly enough of this book. It really has changed my life. I'm so excited to implement Mastin's advice and see where this takes me in the next six months. I really value his authenticity; hearing his story and the trials he went through to get where he is now is so inspiring and it really puts the process of self-empowerment and transformation into perspective. I don't know about you, but I spent a lot of my life thinking that successful people were born lucky, or were genetically programmed for success, or they just had better brains, more talent, had better connections, more wealth, were more self-aware, had more emotionally-intelligent parents than mine, blah blah blah, than I. Now I have a much more empowering view: First, that we are all on our own path, Second, when we own our path and choose to walk it mindfully miracles happen, and Third, I can step into my greatest self and it will benefit EVERYONE, and what better reason to take up space on this planet than to be of benefit to EVERYONE? If you are on the path of self-discovery, I HIGHLY, ULTRA HIGHLY recommend this book. If you commit to the work and really do it, it will change your life. May the force be with you! 5.0 out of 5 starsBrace Yourself! Your Life is About to Improve! 5.0 out of 5 starsMastin Kipp delivers BIG time the tools to Claim Your Power! ✭✭✭✭✭ I'm adding 5 more stars because this is a 10 star journey to Claim Your Power! I took the courageous step this year to enroll in Mastin Kipp's Claim Your Power online program because I needed to discover why I'd not been fully engaged in my coaching business after 2 years. Why was I stuck? Why had I now gone through the heart-breaking experience of ending my 2nd marriage? What is wrong with me? Well, let me tell you Mastin delivers all that he promises and so much more! This is a deep dive and that is why I use the word 'courage'. I'm beginning to uncover the 'real' me, I'm connecting to my heart again, I'm accepting all that I am, and I now know my life's purpose and how that will manifest complete abundance in my life. I wish this for you too! If this resonates with you please listen to this short training and HUGE announcement from Mastin and then take the first courageous step and order this book, sign-up for the absolutely FREE training course AND begin discovering your life's purpose and living an abundant life! Mastin serves from a generous heart, this is his passion. I believe if you take this opportunity to meet Mastin through this training, his book, and free course guidance/coaching you too will come to know his generous heart. I've gone through the CYP online program, attended CYP Live 2017, and now purchased the book. I highly recommend connecting with all that Mastin Kipp offers. If you do it will change your life. (of course, implementing is your choice). There are a lot of self-help books on the market. This one is WAY BEYOND self-help. Just the first 40 pages alone are pure gold. In an age of disconnection and distraction, it's time to be powerful on purpose individuals again. Mastin tackles this from the core, not focusing on a huge to do list of everything you need to do on the outside, but what needs to be done, revealed, acknowledged and healed to make you whole from the inside out. There is even a 40 day companion course with the book that is absolutely amazing. If you are ready to dive in and do the work... to roll up your sleeves and get to know the real you... pick up this book... NOW! Thank you Mastin!